VecTor3 is a nonlinear finite element analysis (NLFEA) program for modelling three-dimensional reinforced concrete continuum structures subjected to a wide range of loading conditions: quasi-static loads (monotonic, cyclic, and reversed cyclic), dynamic loads (seismic, impact, and blast), and fire. While primarily formulated for reinforced concrete, several other continuum material types (concrete, SFRC, steel plate, etc.) and reinforcement types (mild steel, prestressing steel, FRP, etc.) can be considered with the built-in material models. 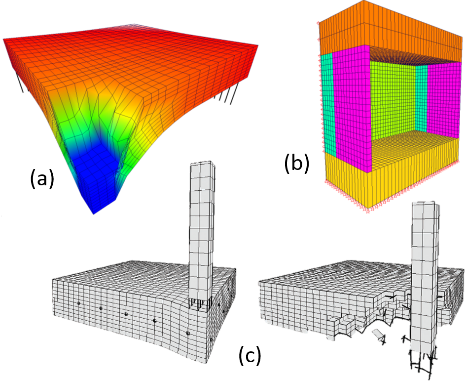 VecTor3 employs a three-dimensional smeared, rotating-crack formulation developed based on two well-recognized analytical models for cracked reinforced concrete: the Modified Compression Field Theory and the Disturbed Stress Field Model. The program’s solution algorithm is based on a secant stiffness formulation using a total load iterative procedure, providing robust performance with good convergence characteristics for different analysis conditions including those with highly nonlinear responses. Advanced mechanisms such as second-order material effects (compression softening, tension stiffening, shear slip along crack surfaces, etc. ), buckling of reinforcing bars, geometric nonlinearity, strain rate effects for dynamic loading conditions, influence of multi-axial stress conditions, confinement effects, and the deterioration of mechanical properties at elevated temperatures for fire loading conditions are explicitly considered. A wide range of material models are available for representing various constitutive responses and mechanisms. The element library includes a 8-node hexahedral or isoparametric hexahedral element (24 d.o.f. ), a 6-node wedge element (18 d.o.f. ), and a 2-node truss bar element (6 d.o.f.). Reinforcement can be modeled either as smeared within the solid elements, or as discrete bars using the truss elements. For modeling mechanisms relating to bar slip and adhesion loss, a 2-node bond link element and a 4-node contact element are also available. One of the unique features of VecTor3 is its comprehensive fire analysis capability for reinforced concrete structures. The analysis procedure uses a coupled heat and moisture transfer algorithm which not only calculates the transient temperature through the depth of concrete members, but also calculates the elevated pore pressure in concrete, enabling the prediction of localized thermally-induced spalling. Another notable feature of the program is its simplified yet reliable analysis procedure for modelling reinforced concrete structures subjected to blast and hard missile impacts. For this purpose, the program is enhanced with special dynamic analysis functions and element erosion capabilities. The analysis capabilities of VecTor3 have been extensively verified against experimental results reported in the literature. All of the verification studies were performed using default material models without fine tuning of the analysis parameters. The verification results have been published in many leading structural engineering journals.